I am writing this to better understand how ec2 internal and external IP addresses change and work within VPC, also to learn how to use VPC. 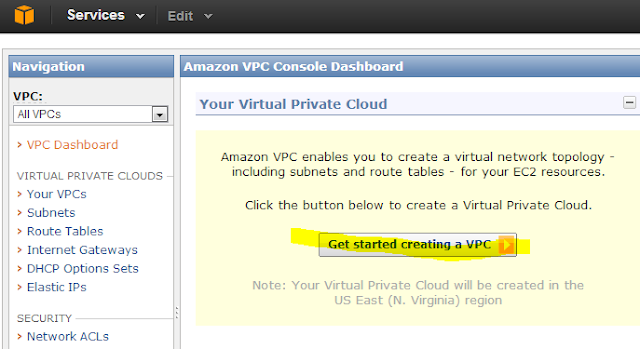 Be warned, this is my first time playing around with VPC. I will do my best, but I am bound to miss some concept. For my virtual private cloud I am going to keep things simple. Something like this figure shown above. 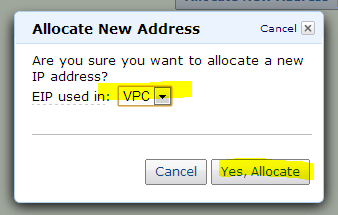 I want a VPC were every system has access to the internet, so I can use things like apt-get within Ubuntu. I only want a few of the systems to be accessible from the internet via SSH or port 80. 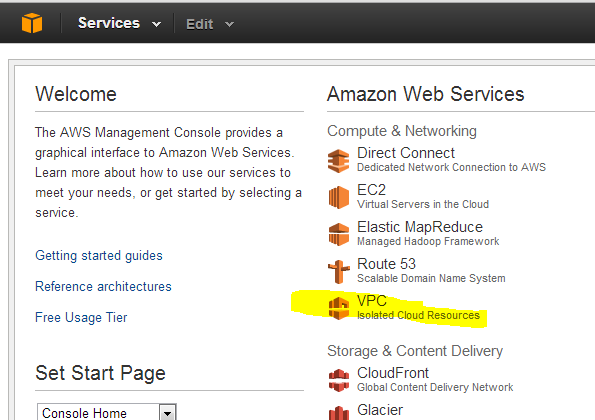 I also want to run an RDS database within the VPC. Sign in the AWS console. 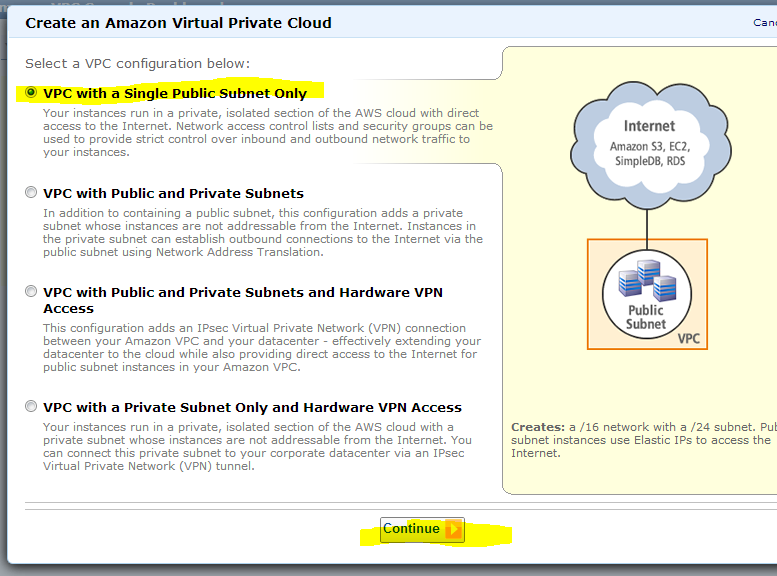 Click on Edit Public Subnet and select us-east-1a as the Availability zone. Before I create an EC2 instance in the VPC it’s important to note this. 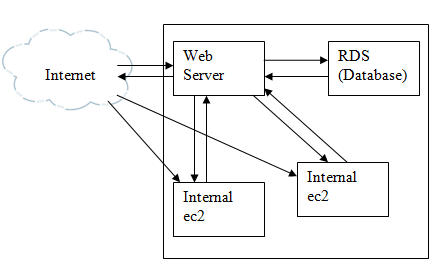 AWS reserves the first four IP addresses and the last IP address in each subnet's CIDR block. They're not available for use. 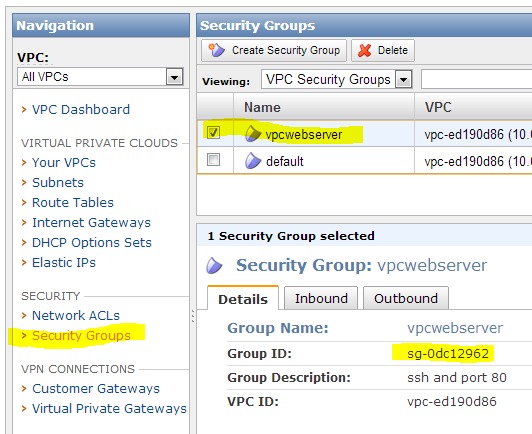 VPC has its own security groups separate from the EC2 security groups. 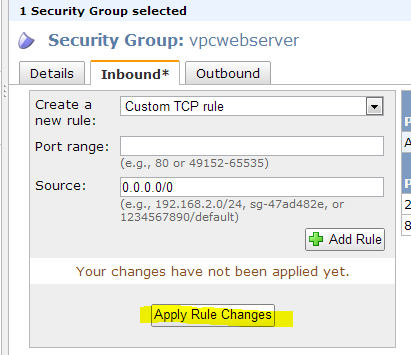 VPC security groups have inbound and outbound rules, where ec2 only has inbound. 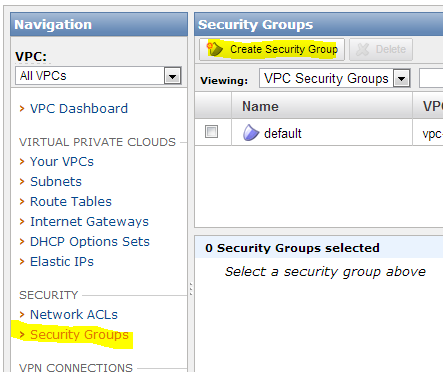 Click on Security groups then on Create Security Group. For this I am simply going to open up port 22 and 80 for Inbound traffic. 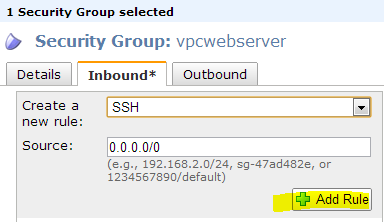 Select the security group then select the inbound tab. 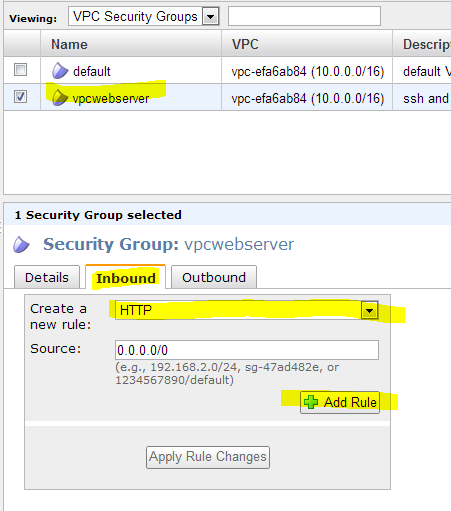 Finally select HTTP and click on Add Rule. 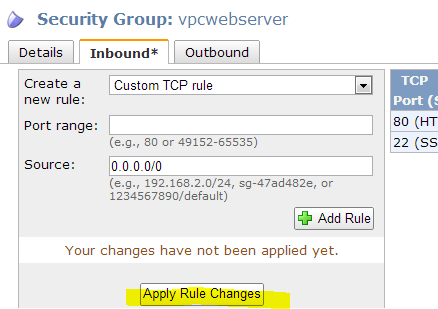 select SSH and click on Add Rule. Now click Apply Rule Change. I am going to create a micro instance running within the subnet. 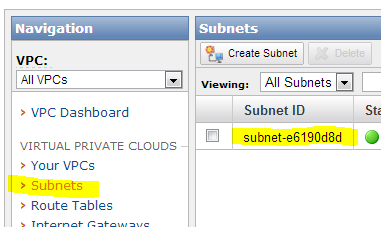 To create an instance within this subnet we need the subnet ID. Click on Subnets then you can copy the subnets id from here. 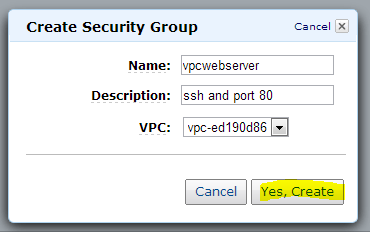 Also when using the command line tool you cannot use the group alias name when starting an ec2 within a VPC you must use the id. 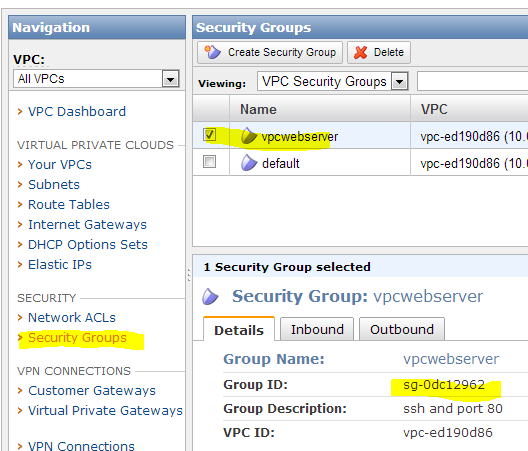 Click on Security Groups and copy the Group ID in the details section. In this case it is sg-0dc12962. Here is my command line, this AMI is an ubuntu 12.04 LTS EBS AMI. The internal IP addresses were added correctly. One thing you will not see here is a public IP address or a public DNS record. So now I need to figure out how to get to this machine? 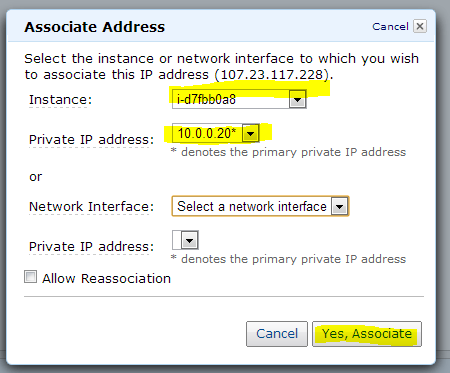 Select the Instance id and click Yes, Associate. 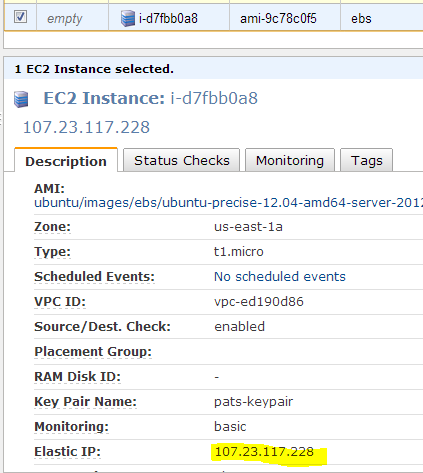 Going back to the EC2 console you can see that this EIP is now associated with this instance. 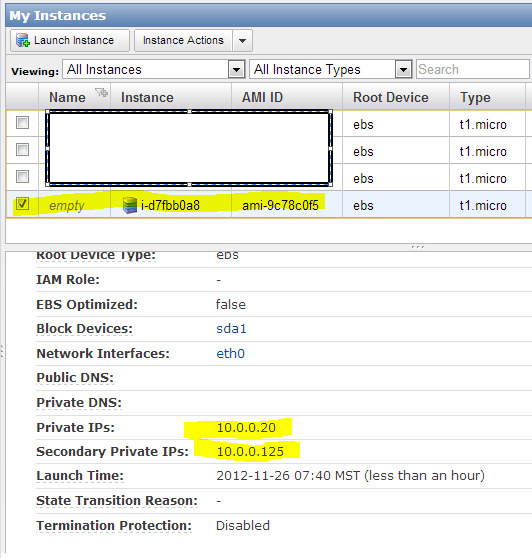 Only the primary internal IP address is shown. This should get the secondary IP address working. 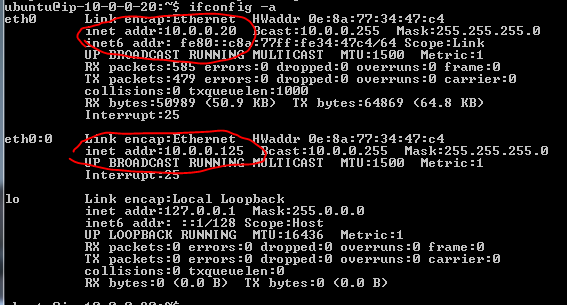 To confirm its working I am going to bring up a second machine in the same subnet but without an EIP. Now I need to fix the VPC security group so that these two machines can talk to each other. Machines with the same security group can’t necessarily talk to one another unless you set it up to do so. Select Security groups. 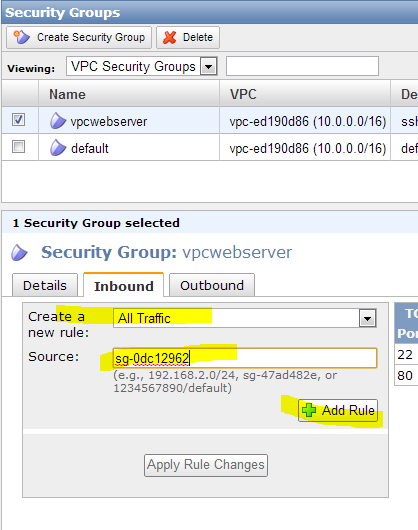 Then select the vpcwebserver group and copy the Group ID in this case "sg-0dc12962"
From the first machine, which has an elastic IP address and the internal addresses 10.0.0.20 and 10.0.0.125, ping the second machine. I can’t ssh into this second box without the keypair. So I will scp it to the home directory from my machine. Now from the first machine. And that gets me in. SCP the keypair to the second machine.